Dan Nevins. Photo via CBS News. In 2004, Dan Nevins was deployed to Iraq with the U.S. Army. After nearly a year of fighting overseas, Dan’s life nearly ended in tragedy. 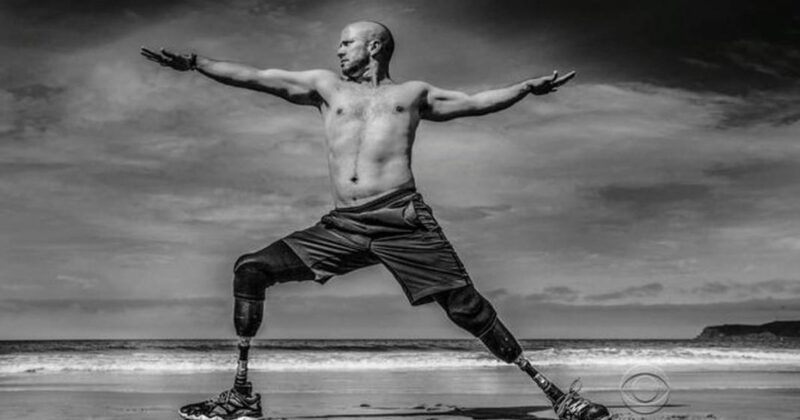 He became a double amputee and life as he knew it changed forever. Then, he found a new source of strength and purpose. Lying on the ground, waiting for help, Nevins thought about his daughter, who was 10 years old at the time. “I had this visualization of my daughter, all grown up and dressed in white and walking down the aisle without her dad. That was the thing — I just shot up.” This vision gave Nevins the willpower to hang on. A medic soon arrived and Nevins was airlifted to a hospital, where he underwent surgery. Nevins ultimately received over 30 surgeries and lost one leg before returning home to the U.S. He had complications with his remaining leg, and that was ultimately amputated, too. He suffered immense pain, but was grateful to be alive. After the Army, he went back to his job in pharmaceutical sales, but felt unfulfilled. He started working with the Wounded Warrior Project and says that’s when he fell in love with helping veterans. Five years ago, Nevins had his final surgery — number 36, he said. “This was different than all the other ones,” Nevins told CBS News. In the past, he received surgery at Walter Reed Medical Center and then recovered with the other veterans there. This time, he had to take off of work to travel to Walter Reed and returned home immediately afterwards to recover alone. “In those eight weeks alone, I’m dealing with the physical pain from the surgery and I’m also just alone,” Nevins said. It was hard for him being unable to take care of his daughters because he couldn’t move around his house. “I was completely isolated. Alone with my thoughts,” he said. Nevins said he struggled mentally during this time. He knew the grim statistic: 22 veterans a day took their own life, according to the VA. But he didn’t originally understand how dark life could get after deployment. “In those eight weeks, I got it,” he said. Nevins said he didn’t want to end his life, but knew he need was going into a darker and darker place. He called a friend for help. “She said, ‘Dan, you need some yoga in your life,'” he recounted. “I said, ‘That’s the dumbest thing I ever heard. '” Nevins said he was originally angry that yoga was even suggested as a solution for his problem. Then, he reluctantly learned some more about the spiritual and physical practice. “I visualized roots growing out of my legs, into the ground,” Nevins said. He pushed himself to get into “warrior one” pose and said it sent a burst of energy through his body. “I was never more alive. I felt eight feet tall and more powerful than I’ve ever felt in my whole life,” he said. That profound experience converted Nevins into a yogi. “It’s like the earth was saying, ‘Dan, where have you been for the last 10 years? '” Nevins remembered. Just a few months later, Nevins was already in yoga teacher training. He went from a skeptic to a full-time yogi, completely devoted to the practice. For the past five years he has been traveling the country as a yoga instructor and motivational speaker. He has taught everywhere from the White House lawn to Bryant Park in the heart of New York City. On Thursday, Nevins was in San Francisco leading a three-day training session for yoga teachers on specifically how to instruct veterans and first-responders. “As far as I know, I’m the only no-legged yoga teacher on the planet,” he said. He is using his personal experience and expertise to show others how teach the community he cares so deeply about. Nevins said he originally started teaching yoga only to veterans, knowing how much they could benefit from the practice. However, he decided to expand his clientele, realizing many people can grow and heal from yoga.